There's no phrase hotter in the tech world than artificial intelligence (AI), and this is especially true in China, where the craze for AI has even sparked concerns about an investment bubble. Amid the AI excitement, smart investors have not lost sight of the fact that China's capabilities still lag behind those of other countries, especially the US. Many have pointed to a talent gap as the main hurdle China will have to overcome to turn itself into a global AI leader. "I spent some time in Stanford and Berkeley last month, and just like 20 years ago [when I was] pursuing a doctorate, [I] asked them to talk about what they were doing. Overall, I felt fairly enlightened. The doctoral candidates there are more competent and their research is more pioneering and creative than the work of their peers in China," said Zhang Hongjiang, head of Technical Strategy Research Center at ByteDance, the parent company of highflying news app Toutiao. Zhang, the former managing director of the Microsoft Advanced Technology Center, made the remarks at a mid-August launch event for the AI Challenger, a new global AI programming contest. The AI Challenger was jointly launched by venture capital firm Sinovation Ventures, search engine Sogou and Toutiao in an attempt to build one of the world's largest open AI databases as well as sharpening the nation's AI skills. The winners of the various categories in the 2017 AI Challenger competition, such as translation, will receive cash rewards totaling 2 million yuan ($299,818). The firms involved will also offer jobs to the winners. The companies have also promised tens of millions of yuan to help establish the AI database, which will be accessible to all researchers and developers. The completion is set to improve China's AI talent pool, said Kai-Fu Lee, whose Sinovation Ventures has invested heavily in AI startups. A July report by professional networking site LinkedIn claimed that China ranks seventh in global AI talent rankings. Of the 1.9 million AI talents spotted by LinkedIn, China boasts only 50,000. The US led the rankings with a talent pool of 850,000. The lack of specific AI courses has been blamed for the talent shortfall. "AI covers a wide range of fields including audio, visual, motion perception and computerized algorithms. No specific programs or courses about AI are now on offer in China for undergraduates, graduates or doctoral students," Cui Yan, president of the Zhuhai AI and IM Research Institute, told the Global Times. But the country enjoys late-comer advantages and is in a good position to catch up, according to Cui. But today, Chinese students looking to enter AI prefer to head to US universities. "I'm currently writing my thesis and if all goes smoothly I will apply for doctorate studies at one of the top universities in the US," 25-year-old Zhang Ruyi, who is now pursuing a master's degree in automation at Tsinghua University, told the Global Times. Zhao Ruihui, a 23-year-old now studying a master's degree in information engineering at Japan's Waseda University, said he will apply to schools in Europe or the US if he decides to continue his studies. That said, the AI Challenger has piqued the interest of both Zhang and Zhao. The contest and the other efforts by domestic firms to incubate AI talent have somewhat eased the worries about the talent gap. DeeCamp, a six-week-long summer camp hosted by Sinovation Ventures to turn AI ideas into a reality, is seen exemplifying the recent push by industry heavyweights to address the talent problem. 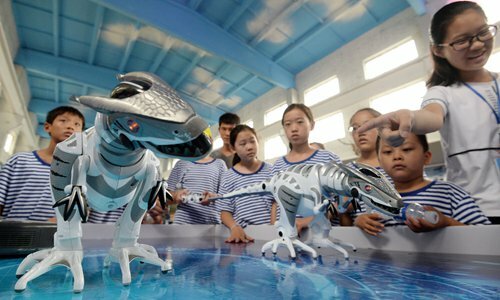 More than 30 Chinese students from elite universities from both home and abroad headed to the camp and showcased their AI projects, including an unmanned supermarket, a delivery robot and an AI chatbot that gives romantic advice. Zhang and Zhao, who both attended the camp, said that such initiatives have encouraged them to eventually pursue their AI careers in China even if they do study abroad first. As Wang Xiaochuan, chief executive of Sogou, said in his speech at the AI Challenger launch event, Chinese firms are running fast in the global AI race and their investment in AI startups and talent-nurturing will keep pace with the country's AI ambitions and probably push the country ahead of the US within five years.